I’m so excited about this collaboration. Christopher David Ryan (an obvious maquette favorite) collaborated with the talented Maria Vettese to create these extremely affordable and gorgeous prints. They’re absolutely perfect for summer. I love the pop of sunshine yellow. 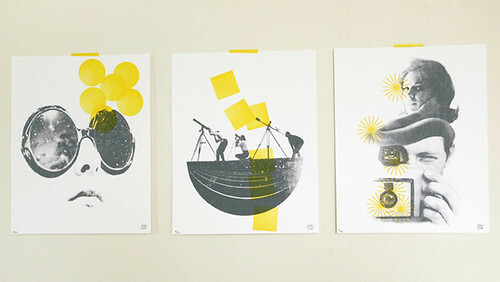 The prints above are limited edition digital & letterpress so get them while you can. I seriously have to restrain because there is absolutely no more room on my walls. I love these so much I’m thinking about what I could replace with them in my house? The sunglasses print is my fav of the lot but they work perfectly as a set, no? love these and had fun poking around the shop. he’s amazing and has such great stuff available in his shop. oh good Jenn! Glad you want to come. I will email you with details soon…. love the pops of yellow in the prints…that’s my favorite color! well you must have a sunny disposition….that yellow is so cheerful and isn’t it just so bright and bold next to the black tones of the photo transfer?! Love it. Great color on these prints – very fun, especially the big sunglasses.